What do you get when you combine a technology trendspotter, tech/business story teller (Shel Israel) with a tech start up, bleeding edge evangelist, early adopter (Robert Scoble)? You get a visionary connection of bits and bytes that is prescient about the future just in front of us, as those piece parts are brought together – in our personal lives, for work, for health, at home, when shopping and yes, the real future of marketing and what it means for business to be connected to customers. 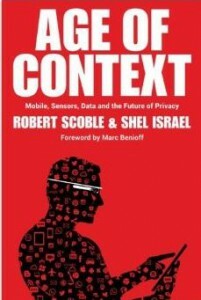 The title “Age of Context: Mobile, Sensors, Data and the Future of Privacy” represents only half of what this book is about. Those are the components, no doubt. But the authors go beyond those piece parts and talk about what the foundation is being put in place for. Their focus is on what that future is all about and what it means for you and me as we meander through our day-to-day lives. Scoble and Israel are a team that move from what is in front of us today to scope out the applications and real world evolutions that are emerging as all of these elements come together in our lives. Irrespective of how that happens from wearables to automobiles to smart homes to healthcare or other devices or in-store experiences and how we shop, the fact is, Scoble and Israel take the piece parts and put together a vision of the whole — for your business to have more meaning and relevance; for how you work; for your health and, frankly, just for your life period. That smart phone in your hand (with all those apps) is just the beginning for the Age of Context. As they did in their previous book “Naked Conversations” they tell real stories, combine the bleeding edges with the real world apps at work today and make the changes in front of us understandable and palpable. They talk about some of the big players and the nascent beginners, stuff in the lab and stuff on its way to commercialization – their strengths, weaknesses, challenges and efforts to get ahead of this game. However, Scoble and Israel never lose sight of the overall path forward and what the “age of context” is all about and what it looks like as we peer into a not too distant future. The chapter on marketing and interruptions of advertising is a phenomenal read with implications for every business to start thinking about today, and figuring out for the not too distant future. While I may be accused of being a fanboy for Israel and Scoble (I am; they are both friends who have taught me a lot over the years), they themselves take a critical look at some of the implications, challenges to adoption and the importance of trust in overcoming the privacy challenges. Im still digesting the bookmarks and notes throughout the book. This is a conversation starter and thought provoker if you dive in and take it seriously. I think you should. I say it is “Fierce” Go read it now.